Remember How Great it All Was? . Like me, I'm sure you remember the allure of James Bond, The Beatles, Hot Chevys, and probably the best television shows ever. With that, I'd like to welcome you to my 60's pages where the summer days are long and hot, and last forever! One thing that I would like to mention is that there will be television shows, people, or even songs that were famous in the fifties, or maybe earlier, but I first became aware of them in the sixties. For example, the program "Peter Gunn" was big in the fifties, but I caught it in syndication in the early sixties. favorite years seem to fall between 1962 and 1967. After that, things began to get more and more complicated. 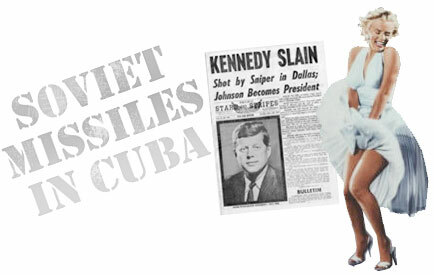 I was in the second grade when the world was panicked over what we now remember as "The Cuban Missile Crisis." As a kid, I never really appreciated the importance of being nearly nuked off the planet. I didn't know what an Atom Bomb was, so therefore, I had no reason to fear it. I have more memories of The Cuban Missile Crisis here. Next came the Kennedy assassination, and the death of America's film goddess Marilyn Monroe. Still, far and away from the tedium of adulthood, there was some serious fun to be had. The guys and me would be out on our stingray bikes riding around, bare-chested and cool. Playing army was my favorite pastime. Kids could actually play in the streets. Neighbors left their doors unlocked at night, and sat on front porches on hot summer eves. I remember playing hide-and-go-seek after the sun went down. Eating Popsicles under the the saffron glow of the street light, or playing nightly games of Army were indeed, commonplace. You could actually peer into open screen doors and watch television through the rusty mesh. And television was great with shows like "Sky King", "Cheyenne", "Combat" and "The Twilight Zone". Drama, Comedy, and even music programs like "Shindig", "Hullabaloo", and "The Lloyd Thaxton Show" featured top performers and would-be up and comers. Whod'a thunk it? Guys like Steve McQueen, Charles Bronson, Robert Duvall, James Coburn, Bruce Lee, and martin Sheen all started off on the black and white tube. Of course, there were some pretty cool gals that came out of the 60's as well, most of them responsible for rev-v-v-ing up my hormones. Seriously, there were shows we watched for fun, and then there were shows we watched for the girls. Diana Rigg of "The Avengers" and Patty Duke were among my favorite secret crushes. Even the music of the sixties was better. After the Beatles re-defined our world on the Ed Sullivan show in 1964, there wasn't one kid on the block who wasn't trying to learn how to play guitar, or speak in a faux-British accents. A multitude of dynamic bands lit up radio dials and sent sizzling notes of sweetness to our radio speakers. Rock n' Roll was here to stay. 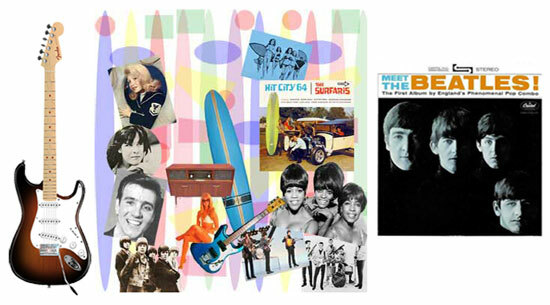 The "British Invasion" gave us groups like The Dave Clark Five, Peter and Gordon, The Kinks, and The Rolling Stones. Here, in the good old U.S. of A, we were busy raising our own crops. Hot bands were forming by the dozens. The Beach Boys, Paul Revere and the Raiders, The Supremes, The Turtles, and the California surf scene and sound became American icons. Just a bit about why I built this site. My 60's pages are a collection of memories, thoughts, with some original art and graphics and a spattering of my own personal photos. I built this site dedicated to my memories hoping to lock a slice of time into our current lifestyle. These pages are basically memoirs of my growing up during one of the most colorful and exciting decades ever. I'd like people to be able to learn something about my time, and how wonderful the period really was. Were the sixties ideal and perfect? For me they were, but I was just a kid. Like any decade, the 60's had their share of turmoil and bad times along with the good. Layout: I designed this site to look like a magazine for one to flip through from page-to-page. It's a "Life Magazine" of my life which accounts for the long pages and sometimes changing banners, backgrounds and colors. I laid these out to be visually appealing, to reflect my moods of the decade and how my memory sees them, rather than following some strict web design guideline. Content: I won't expound too much on the hippie days, or the turbulence of the Viet Nam war, protest marches, and the post-mortem-power-to-the-people existence that ear-marked the mid to late sixties. It was a confusing time, and even though I was a "hippie" in the 70's, the memories of those days aren't nearly as cherished as the more innocent fun of the 60's. Times were simple. Whatever fun we had, we had to make for ourselves. Symbolism meant so much more to us than actual possesions, or store-bought things. Inventiveness was more than just a necessity; it was the realm that separated fun from reality, and stirred our imaginations. Play time was creative. Games were invented when the old ones became dull. Toys were likewise created when the real things weren't available. I can recall using tree branches for army rifles and blocks of wood for walkie-talkies. If you didn't have a cowboy pistol, forefinger and thumb worked great. The best part: you could never misplace your weapon. You made these wonderful clicking sounds when cocking the ol' sharpshooter, and making the same noises for returning it to the invisible holster on your hip. People had to discover things for themselves; we had no access to online information, but somehow we got by! To us, a text message was what you scribbled on schoolyard concrete; a chat room was inside your secret fort or the sanctity of your bedroom; Blogs were the monsters in the closet, or the creatures trapped inside the TV screens of Saturday afternoon horror matinees. Unlike today, people connected and not vice-versa. With that I mean to say that a lack of technological advancement never stopped us from having the times of our lives. Imagination was more valuable than anything, and I'd swap out a cell phone for a homemade kite any old day of the week. So, before I bore you silly, I'll just let you cruise through the site and hope that you enjoy yourself. My memories are very valuable to me. Our daily lives can quite easily spiral out of our control, and the further we zoom in on the future, the less control over our lives that we have. Still, where would we be without our computers, cell phones, and debit cards? These days we live in now with our new and modern technology, have allowed us so much more freedom to create. Our new innovations have permitted me to build this web site that you're reading now. But, the past is cherished, and this past, I have made for you. 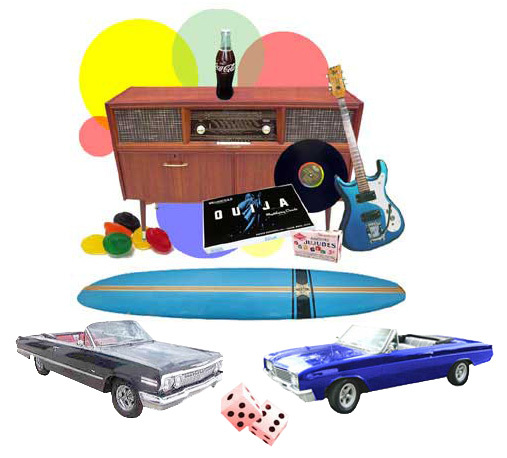 I was born in July of 1955 and cruised into the 60's rather nicely with the fondest of memories. My mother had her work cut out for her raising five of us boys. I grew up primarily in the neighborhoods of Southeast Portland, Oregon. I'm a free lance graphic designer and do Photoshop retouching for a living. You can visit my professional site here. All of the graphics and some of the photos on this site were done by me, as well as much of the imagery that has been re-created. If you'd like to see any of my personal artworks, you can see them here. My wife and I are also devout animal lovers. We love 'em all. We currently have 2 cats, and I am fanatical about dogs. Formerly, I was a social worker, and would love to get back into that, but the jobs are harder to find now. These days I concentrate mostly on guitar - blues primarily, and some acoustic fingerstyle. Serving write my essay requests with expert essay writers. Professional essay writers online to help you with your essay papers. Do my math for me you say? Let us start helping right now! Check CustomWritings - paper writing service for ordering customized research projects and term papers. Do you have some urgent deadline at school and you don't know what to do and how to find the right way? PaperLeaf homework service is always ready to help you! Make just one click! For purposes of citation (I get many requests), I am the sole author of this site unless otherwise noted. If you have any questions about the 60's, feel free to ask me here. If you need to find any public information about any website.owner, visit www.whois.com and type in the name of the site in the search box.